"The European banking industry remains structurally vulnerable," said Carola Schuler, managing director at Moody's, in a presentation on the sector's outlook. The agencies said moves to reduce implied government support for the banking sector and force bank debt holders to participate by coming to the aid of wayward lenders would also put downward pressure on bank ratings. "The European bail-in tool decreases the predictability of state support," said S&P managing director Stefan Best in a separate presentation on banking prospects. As a result, S&P has a negative outlook on certain European banks. The agency will review in early January its credit ratings for banks in Austria, Germany and the UK, three countries that plan to translate EU bank resolution and recovery rules into national law ahead of the scheduled EU start in January 2016. Austria's Erste Group and Raiffeisen Zentralbank [RZB.UL], Germany's Deutsche Bank and Commerzbank , and the UK's Barclays , HSBC , Lloyds and RBS are among those with negative outlooks on S&P's list of large banks enjoying government support. The credit rating agency's forecast follows the European Central Bank's (ECB) reduction of the euro zone's 2015 growth estimate last week. ECB chief Mario Draghi reduced the forecast for the single currency area's Gross Domestic Product (GDP) number for next year to 1 per cent. Falling oil prices and a weakening economic outlook were cited as reasons behind the 0.7 per cent reduction from the ECB's September forecast. Credit ratings agencies' frequent warnings regarding bail-ins in recent months have largely been ignored. In March of this year, credit rating agency Standard and Poor's (S&P) warned that the move towards "bail-ins" and away from "bailouts" continues to evolve and pose risks to European banks and their credit ratings. Bank of England plans to make bondholders and depositors bear the cost of bailing out failing banks, led Moody�s to downgrade its outlook on the UK banking sector this August. The rating agency said that it had changed its outlook for the UK financial system from �stable� to �negative�, citing the developing global �bail in regime� of creditor and depositor bail-in. Moody�s have warned of bail-ins numerous times in recent months. In June of this year, Moody�s cut the outlook for Canadian bank debt to negative over the new �bail-in� regime. Depositors in some Cyprus banks saw 50% or more of their life savings confiscated overnight. The truth is that banks in most western nations are vulnerable to bail-ins in 2015 and the recent G20 meeting in Brisbane was a further move towards the stealth bail-in regimes. More than seven years after the start of the financial crisis, banks have made strides towards improving financial stability but they are still struggling and pose risks. 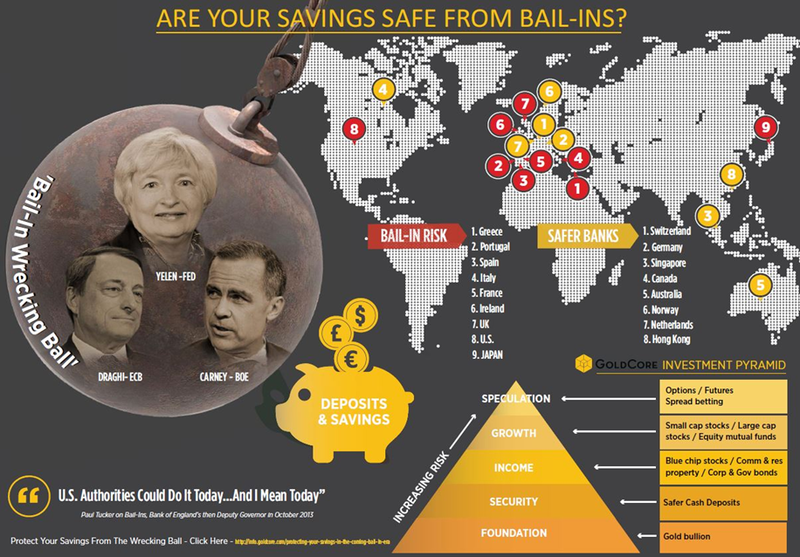 The move by western nations towards bail-in regimes whereby �too big to fail� banks confiscate individual and companies' deposits has been put in place with very little public discussion or awareness of the risks and ramifications of bail-ins. The highlights of the G-20 meeting in Brisbane last month were the increasing tension between certain western leaders and Russian President Vladimir Putin, the �agreement� that the governments of the twenty richest countries would have a clear target and generate 3% global growth, apparently by dictate and some obscure solutions for global warming or climate change. A story, which passed under the radar but which is of more significance to savers, was the agreement to institutionalise in the legal systems of the member states the concept of bail-ins. It will be recalled that the policy was first foisted upon Cyprus when their bloated financial sector got into trouble back in early 2013. It was then that deposits of banks were first considered as part of the bank�s capital and deposits over �100,000 were forcibly converted to shares of a now worthless bank. To stem the public outcry across Europe it was emphasised that the rule of law need not apply in this instance because Cyprus was a haven for �dirty� and �hot� Russian money. The huge flows of similar hot money from all over the world into London and the UK and New York and the U.S. was ignored. At the Brisbane summit, new measures were announced dealing with the capital requirement of around 30 GSIBS, Globally Systemically Important Banks . The announcement was lauded by the bankers as a triumph for the taxpayer. The fact that bond holders and depositors of the bank may have to �step in� to bail out the bank was not mentioned and nor were basic questions asked about the risks of bail-ins to savers and companies around the world. 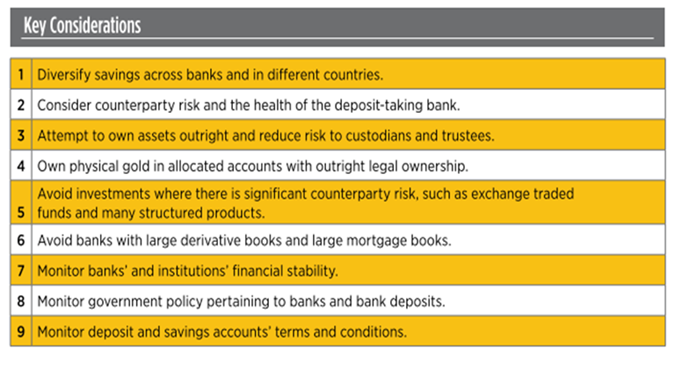 Under the new regulations, these banks would be required to have 16-25% of their capital on hand as a buffer, should another banking crisis arise. What has been generally ignored is that deposits are not sacrosanct in this new arrangement. The most crucial element of this new arrangement is that banks' obligations to each other stemming from their activities in the derivatives markets are also prioritised above larger deposits. 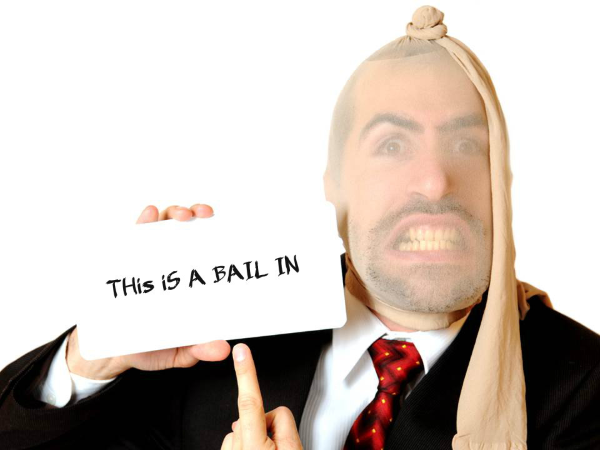 So far from ending the �too big to fail� paradigm � recent developments appear to have reinforced it. In the U.S., the derivatives market involved financial transactions to the value of a phenomenal $297.5 trillion in March 2013. Deposits at U.S. commercial banks were valued at a mere $9.3 trillion. If bail-ins take place, which now seems almost certain when banks get into difficulty again, there is a very significant risk that bail-ins alone will lead to a collapse in consumer and business confidence as consumers and businesses see their savings and capital confiscated. This alone will likely compound a difficult economic environment and lead to sharp recessions and depressions - economic contagion. There is also the financial contagion risk. Much of the bonds are held by pensions funds, institutions and even leveraged investors like hedge funds. If much of the loss-absorbing debt is held by leveraged investors then there is a risk of contagion across the financial system and the contagion boomerang back to banks. Today�s AM fix was USD 1,206.50, EUR 975.98 and GBP 770.98 per ounce. Yesterday�s AM fix was USD 1,195.25, EUR 975.48 and GBP 766.73 per ounce. 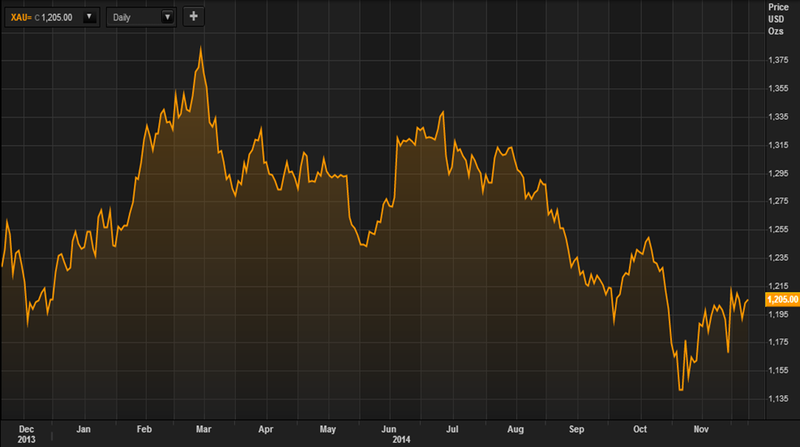 Spot gold rose 0.2% to $1,206.80/oz in late morning trade in London today. Gold jumped to a session high of $1208.85 in early afternoon trade in New York yesterday and ended with a gain of 1.14%. Silver surged to as high as $16.423 and ended with a gain of 0.55%. Gold rose for a second day today, to trade back above $1,200 an ounce, as the U.S. dollar gave up early gains and Asian and European stocks followed their U.S. counterparts lower. Gold jumped 1% on Monday on technical trading and physical buying. Gold in Singapore ticked marginally lower after the gains in New York but remained above the important $1,200/oz level. We are bearish on gold in the short term and think that we may see futures selling pressurise gold into year end as was seen at year end last year (see chart). Gold ticked higher in early December last year prior to aggressive selling in the futures market pushed prices lower from December 10th, prior to gold bottoming on the last trading day of the year. This potential weakness may create a buying opportunity in late December prior to a sharp rally in January and February as was seen last year. Sentiment towards gold remains bearish as seen in the SPDR Gold Trust, the world's largest gold exchange-traded fund, which saw its holdings resume declines after a brief uptick and were close to six-year lows on yesterday. A factor hurting sentiment is the recent strength in the dollar. Although, the dollar looks quite overvalued now and is due a correction which should support gold. Since June, the dollar had begun to show weakness versus the Chinese yuan and we believe that this may be a precursor to dollar weakness in 2015, particularly in gold terms.